Tried to enjoy the post (relevant to my job; I use/have looked at some of these tools), but had to stop reading halfway through because I found the incessant male=default language so disheartening. Words that to some people are just a style choice or not even thought about at all, can be very you’re-not-welcome-here to those who are made invisible by those words. I’m really sorry my post felt woman-unfriendly because of my bad gender choices. I have edited the post (used the more neutral plural form where possible and converted the release manager to a woman – which was the case during the final 6 months of the project :-)) in an attempt to make it more woman-friendly and I would be delighted if you would give my post another chance and let me know your thoughts – both on the gender topic as on the release-related stuff. At a previous job I inherited the release manager hat but didn’t have access to sophisticated relevant tools, more the “managed by a combination of Excel, Word, e-mail, and a lot of plain simple human communication” approach (I had been doing CM with a combination of SVN, scripts, and some issue-tracking tools). At my current job, we’re using an older UrbanCode tool, AnthillPro, for the build and deploy automation scheduling/management, and a combination of other tools for change management, code reviews, etc. … integrated to a degree. Other folks deal more with release management / product management. Your release orchestration perspective is a fresh one to me — I’ve read a lot of CM/DevOps posts about Chef and Puppet over the last year, and Git/Subversion/Ant/Maven/Nexus-level discussions, but not so much about enterprises that have multiple moving pieces to deploy that *have* to be coordinated together in the way you talk about here. 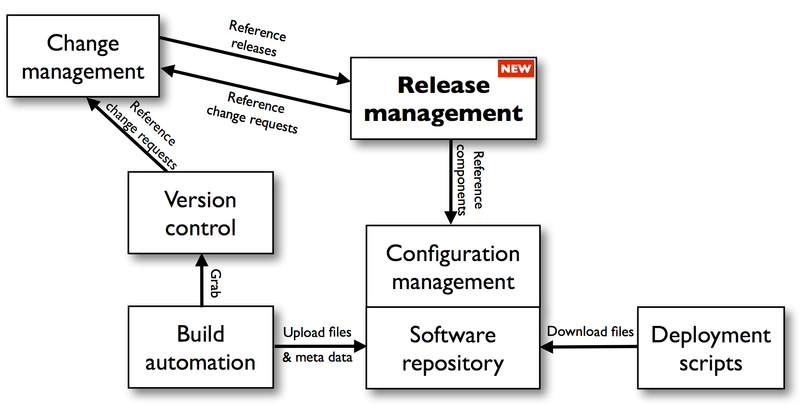 The Release Process Manager tool that lets you map pretty closely to the old manual steps (not such a wrenching change) but still improve the information and visibility/transparency of the processes sounds good — as you say, there are more tools now that support the release coordination efforts, but there is an opening for tools that would let folks download and play around with them more without a lot of ceremony (sales/marketing). 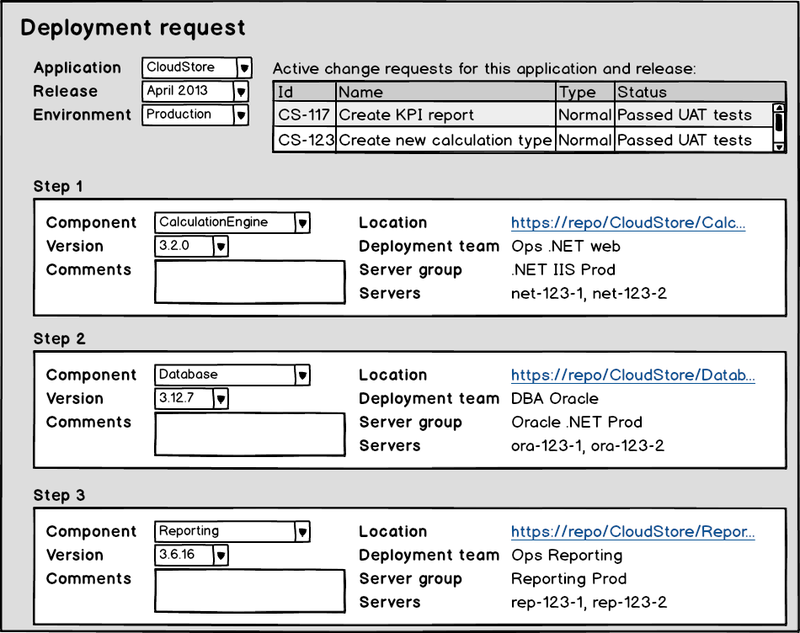 I like the idea of the release management tool being able to to automatically create of a first draft of the deployment request from the configuration management tool (less chance of errors that way, too). Niek, A well-done series with an excellent amount of details and thoughts that went into the posts. Thanks for sharing your experience. After a long time I came across an article which kind of fits with the reality and you have shared detailed information on how release management role is structured across many large scale enterprises. Working as Release Manager over the last number of years, I have struggled find out answers tto many scenarios you have shared. – Single Tool – Requirements for single automated tool that can be used for deploying across test and live infrastructures. Some thing else that you have not mentioned in the post is the relation between environments and releases. Software environments are quite complicated and transition of releases across environments is often error prone. Management of environments is hell of lot of problem when there is a lot of integration. Anyway..Thanks for sharing your thoughts. I enjoyed reading the article.. Regarding your comment about environment management: did you already have a look at http://www.plutora.com? I know they have a tool that focuses on that aspect. Thanks so much for this very detailed series of posts. I had not been able to find any details on a specific Release Management tool (as opposed to deployment automation tools or Change Management tracking tools). From the last response, is Plutora a better tool than RPM because it can both manage releases and statuses of the Test Environments? It has been a while since I looked at Plutora but if I remember well it focused mainly on the release and environment planning aspects and less on the release engineering side so difficult to compare the two. I think both are great tools and which tool is best largely depends on your specific situation. Thanks so much for your series of blogs posts on release management in an enterprise. Do you think that Plutora is a better bet than RPM because if offers Environment Management as well? This is a well rounded article Niek and your comments around “Release Deployment Plan” is spot on. We spent 4 months doing PoC’s and tool comparisons for a Enterprise Release Management toolset which needed to include deployment coordination features and we found Plutora was ahead of the pack. We compared Service-now, Serena and IBM but Plutora was the only toolset which actually addressed our requirements in the release and deployment coordination space. We had been on XLS and sharepoint for so long until management decided to embark on this project and we’re now waiting for the exco to give us the green light to roll out Plutora. Thanks for taking the time to write this excellent blog post series. A lot of your problems sounds very familiar and I LoLed several times. As you say coordination grows super-linearly with number of components unless you decouple. We always stress that tools and process can only get you half way to mature well functioning continuous delivery – the high level architecture must change to get further.